Seared Honey Garlic Butter Shrimp coated in the best honey garlic butter sauce is a quick and simple shrimp recipe guaranteed to impress! 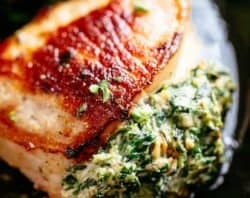 Since posting this incredibly popular Honey Garlic Butter Salmon, I’ve been flooded with so many emails from my loyal readers asking for a shrimp version. Therefore due to popular demand, here it is! The best buttery honey garlic shrimp to hit your dinner table ready in less than 10 minutes, and tastes better than any restaurant! 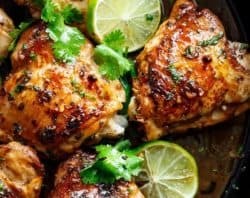 No marinading needed! 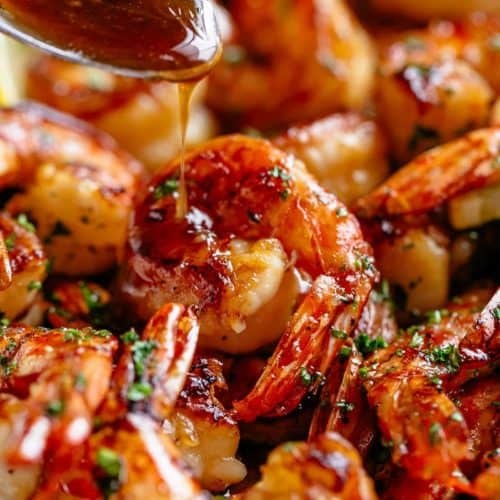 This Honey Garlic Shrimp recipe comes to you adapted from our Browned Butter Honey Garlic Shrimp. With the video up on Facebook (here), many readers have been asking if there is a way to make that recipe without browning any butter. YES, THERE IS! First, we start with my world-wide famous Honey Garlic Butter Sauce! Where garlic butter meets honey to create one of the best flavour combinations you can literally put on anything. Butter — use unsalted and adjust the amount of salt when taste testing. Honey — any honey is fine to use. Garlic — fresh garlic is best but you can use store bought minced garlic if pressed for time. Lemon juice (or vinegar) — cuts through the sweetness of the honey. You can leave it out if you wish, but the acidity adds another depth of flavour in the sauce. If using vinegar, you can use white or apple cider! Parsley — swap out parsley for rosemary or thyme to add another flavour profile to this incredible Honey Garlic Butter! Throw your sauce ingredients in your pan first so all of the flavours blend and melt through each other…then remove just over half and sear your shrimp. You will need to add a little olive oil to the pan so they cook easily without sticking or burning the sauce. Also, cook in batches of two or three to avoid over-crowding the pan. Wipe the pan over with paper towel between batches to start again with fresh sauce and oil, so each batch is just as good as the first! You end up with a super addictive Shrimp dinner ready in under 10 minutes! 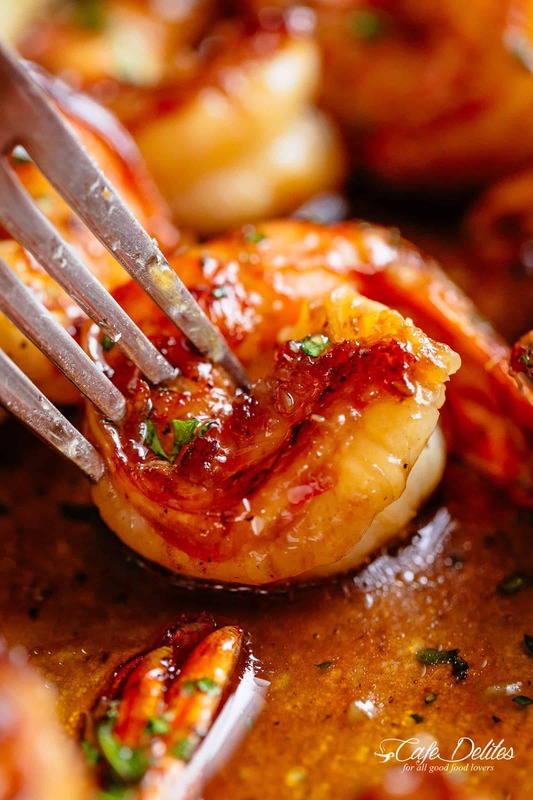 Tender shrimp with crisp, caramelised edges, swimming in the most perfect liquid gold! Sweet, tangy and salty all in one! 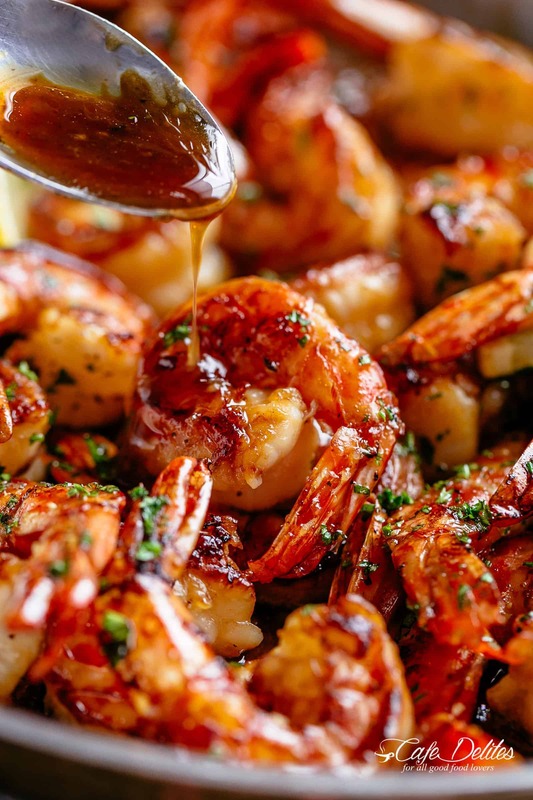 Your family will go crazy for this honey garlic shrimp recipe! Out of all the shrimp recipes on Cafe Delites, this is one of the BEST! Creamy Tuscan Shrimp, this Creamy Shrimp Piccata, Garlic Butter Shrimp Scampi and Creamy Lemon Parmesan Shrimp. So many to choose from! Seared Buttery Honey Garlic Shrimp coated in the best honey garlic butter sauce is a quick and simple shrimp recipe guaranteed to impress! 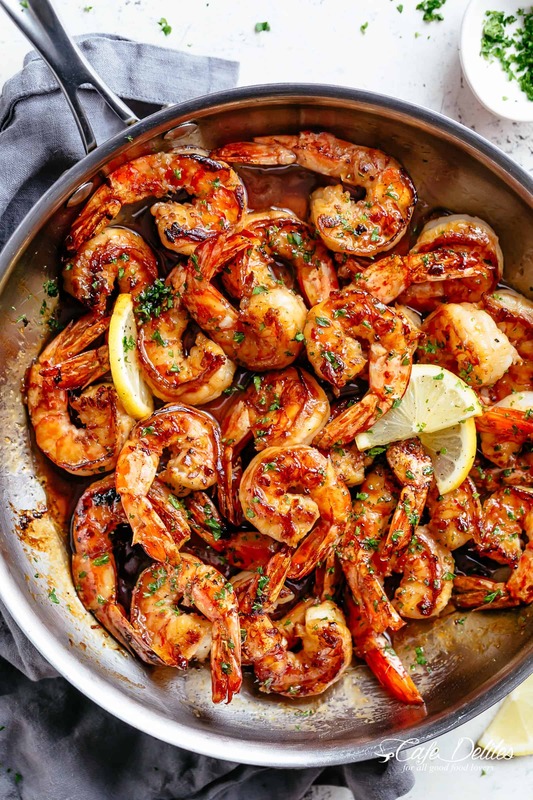 This is the best shrimp recipe to hit your dinner table! Restaurant quality flavour ready in less than 10 minutes! No marinading needed! Melt butter in a non stick pan or skillet over medium-high heat. Add the honey, lemon juice and garlic; stir well to combine all of the flavours together and cook for 30 seconds until the garlic is fragrant. Remove from heat. 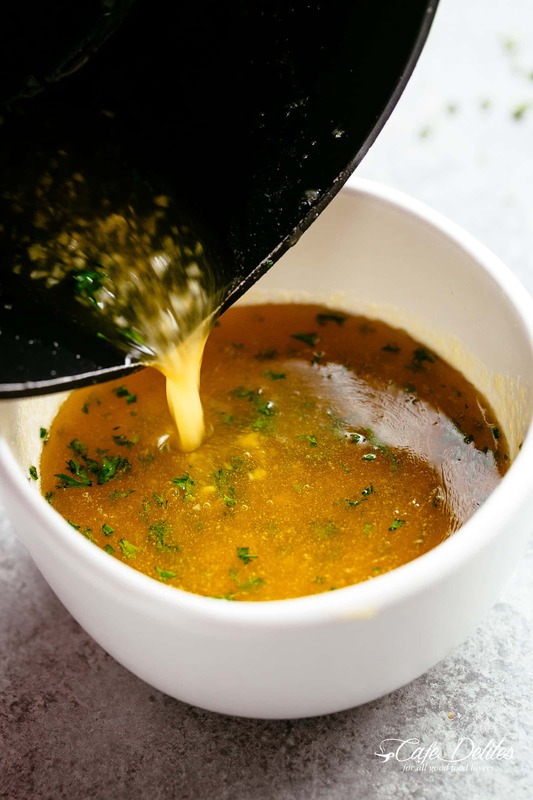 Pour out just over half of the honey garlic butter from the pan, leaving 2 tablespoons in the pan; reserve the rest for later. Add 2 teaspoons of the oil into the same pan and sear half of the shrimp for about 2 minutes each side, or until just cooked through and no longer opaque. Transfer to a plate; set aside. Wipe pan over with paper towel and repeat with remaining oil and shrimp. Throw the cooked shrimp back into the pan and pour in the remaining honey garlic butter sauce, stirring through the shrimp to evenly coat. Season with salt and pepper if desired and garnish with parsley. Prepared as written. Was fantastic! Served with noodles. 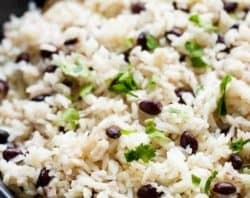 Asian wife and daughter (also myself) loved the recipe! Sweet, tangy and garlicky! 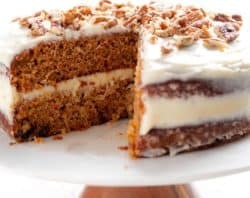 Definitely on our recipes rotation! We would highly recommend this to everyone who enjoys shrimp based meal! Yes, any of those sides would be great with it! 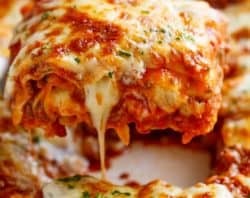 Made this tonite, scaled it down to serve 2, great taste and very easy and fast to make, out of five stars this was a solid five! That is great to hear! I am so glad that you are going to try these! Enjoy! Gorgeous! My fork is ready. I can’t wait to give this recipe a try. 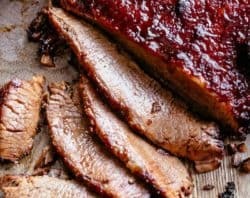 Would love to try this recipe do you think I could sub in sugar free maple syrup? Or is there another alternative you would recommend? That that sounds great! I am so glad that you are trying these shrimp! Enjoy! Is their a way to use this as a marinade and cook on skewers on a grill? Great idea! Yes, go for it! This shrimp dish sounds amazing, and those pictures appear to be proof of that fact. Normally I would only post a comment after trying a dish, but I’m writing now because I would like to know your thoughts of treating this dish like a baked Shrimp Scampi versus the pan searing. 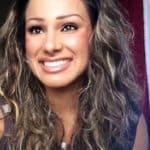 Thank you Karina for always getting my brain/heart thinking about dinner……even at 7:00 a.m.! Yes, that sounds great! It will taste great! Let me know how it turns out! Thanks for following along with me!